We’ve all been there. We take business cards and they get lost, we shake a hand and don’t catch a name, or even worse, they make it all the way into our database, but somehow they still somehow fall through the cracks. What do all of these scenarios have in common? Human error. Yep. That’s right. Human error causes you to lose clients, lose money, and keep you and your business from hitting that next milestone. 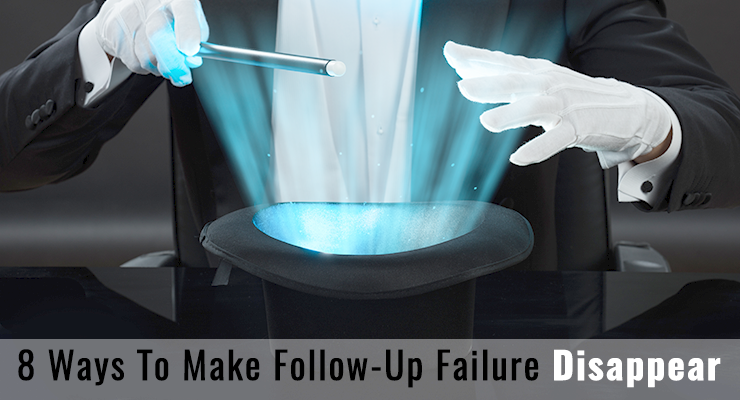 So what do you do to eliminate that deadly follow-up failure? You can’t stop being human, and you can’t just “try harder” because Murphy’s Law still applies. That’s why we’ve collaborated this list of the top 8 Ways to Make Follow-Up Failure Disappear. Text-to-Lead is an incredibly impressive aspect of automation. Say you’re speaking from stage, and there are 500 people in the audience watching you, taking notes. What are the odds you’ll actually get to go to each individual person in that crowd and thank them for coming? Odds are at about 0%, especially if you want to be relaxed and give each conversation you have its due diligence. Back to speaking onstage: say you’re just now getting into your content, and you’re noticing that some people are focusing too hard on writing down notes from your PowerPoint, and not focusing well on the message you’re communicating. Instead of seeing the tops of their heads for the majority of your presentation, start off with a bang. Introduce yourself and say, “Hi, my name is ______, and during my presentation, you don’t have to arduously take notes, because I’m sending them to your inbox for free with a simple text message. Everyone pull out your phones!” Even if only half of the room decides to participate in your fun experiment, you’ve gathered 250 new leads. Where does automation come into play, you ask? After you send this text message, a tag is automatically placed on your new prospect. They are placed into a sales pipeline for your staff to followup with, they are placed into a new lead nurturing email campaign (that sends them into long-term nurturing down the road), and you don’t ever have to worry about them again. But that’s not all. Think about all of the other times you could use this: you’re at the bar with your buddies, and you strike up a conversation with someone who would make a great prospect. Get them to send a text, and they’re yours. You’re on the plane on the way to a seminar or speaking engagement, and you happen to be sitting next to a business owner who could use your services. Text. It’s that simple. On-Demand Scheduling saves you and your staff tons of time. Think about how many hours per week are spent on the phone or over email trying to reschedule missed meetings or pick the right time for a first meeting. It really adds up. Getting an online scheduler that automatically syncs up with your calendar could really make a difference in how many sales meetings you get, and as a result, how many sales meetings you close. Placing a link to your online scheduler in your emails, embedding it on your website, and sending it out in your Text-to-Lead messaging system could score you tons of extra meetings every week. A lot of people are too busy to answer their phones and nail down a specific time, and would prefer choosing a time to meet with you on their own. Another benefit to on-demand scheduling is the fact that it is not bound to working hours. If a client is perusing your website or looking at your email after they get off work or on the weekend, they can schedule a meeting with you right then and there. You could be getting more meetings in your sleep. The Sales Pipeline allows you (and your staff) to send each and every new prospect through an iron-clad follow-up process. Systems like these allow you to see exactly where all of your leads are in the decision-making process. You’ll know if you called them once and left a voicemail, if you called them and they had interest in your A, B, or C service/product, if you called them and were able to schedule a meeting, and so on. Never be confused about your prospects again, and market to them how they want to be marketed to. Every time a prospect is moved down the pipe, you can arrange for an email to automatically be sent. For instance, if you leave a voicemail with a prospect, you can have an email that goes out automatically saying you’re sorry you missed them, and paste a link to your online scheduler in case they happen to prefer that method of scheduling meetings. Seamless. Gone are the days of collecting business cards and letting them sit on your desk. With the Snap App, you can snap a photo of the business cards you receive on the spot and they will be automatically entered into your database, and placed into a new lead nurture sequence. Sending your new leads into a sequence specific to them right away will increase your chances of getting meetings with them down the road. Don’t let them forget who you are after their first few interactions with you. Send them into a new lead nurturing campaign that includes a photo of you, a description of the event at which you met, and a link to your online scheduler. The new lead nurture sequence is different than the long-term nurture sequence, because you want to introduce them to your company before your start throwing your marketing materials at them. You’d like to send a few “welcome” emails to start your relationship of correctly. Your new lead nurture sequence also contains backend automation that helps put them into the sales pipeline as well. Schedule a meeting with them right away instead of letting them sit idly in your database for months. Ad re-targeting comes in handy for those leads that say “not right now,” as well. Placing a pixel on your website that keeps track of your prospects and markets to them through ads on their social media accounts (or elsewhere) can keep your brand in front of their eyes very successfully, and relatively inexpensively. Staff reminders are a great way to utilize automation in your follow-up. Having triggered staff reminder emails and pop-up windows to give a prospect a follow-up phone call or email can make a world of a difference in how many meetings you score as well as how many deals you close. Eliminating that human error percentile will change everything about the way you communicate with your prospects. Persistent follow-up not only achieves the goal you’re striving toward (making more money and changing more lives), but also every business owner appreciates thorough follow-up. So, if nothing else, they will know you mean business and will be likely to buy from you in the future or refer you to someone who could use you.